The medieval cope of Vic in Spain was restored in the Abegg foundation's textile atelier. It is made from red velvet and it was embroidered by english workmen. 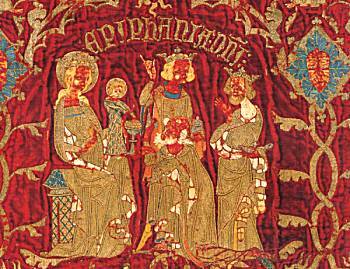 At this time english gold and silk embroideries were of Europa's most loved luxury goods and also a symbol of status. The cope was given to the treasury of the cathedral of Vic as a present by bishop Ramon de Bellera (bishop from 1352 to 1377). After the exhibition in the Abegg foundation the cope will be brought back to its owners in Vic, in the Museu Episcopal.